Looking back at 2018 I have built and painted a lot of models. I did many conversions and always tried to make myminis look special. Here are some fellow models I really enjoyed while “being on a journey” with. Wenn ich auf das letzte Jahr zurückschaue, habe ich einiges gebaut und bemalt – hier präsentiere ich Euch einige Favoriten meiner Reise durch die Hobbywelt. The Wolves are almost ready! I was a lot of fun converting these models into Space Wolves and I put a lot of thought into it again to reach the same style and the spirit of the first commission for Jesse. The rest of his order will follow soon – till the end of the year I hope. Seit einiger Zeit arbeite ich an diversen Projekten rund um das Tabletop Universum. Es kam durch einige glückliche Fügungen soweit, dass ich ein komplettes Marker Set für Malifaux gestaltet habe und dieses nun fertig ist. Man kann es im Kölner Laden Top Tables bewundern und demnächst auch käuflich erwerben. Neben den Arbeiten an den Marker Sets (ja, Plural – da kommt noch mehr) habe ich ein paar Transport Sets entworfen, die es erlauben, Eure Minis in Ikea-Boxen zu transportieren. In Aachen gibt es einen Laden namens Laserkatze GbR, in dem ein sehr sympathisches Geschwisterpaar meine Design in fertige Produkte umsetzt. Since we have a Primarch incoming I allow myself to cheer and make a promise: next to the Space Wolves I will start a diary about my Death Guard Army. 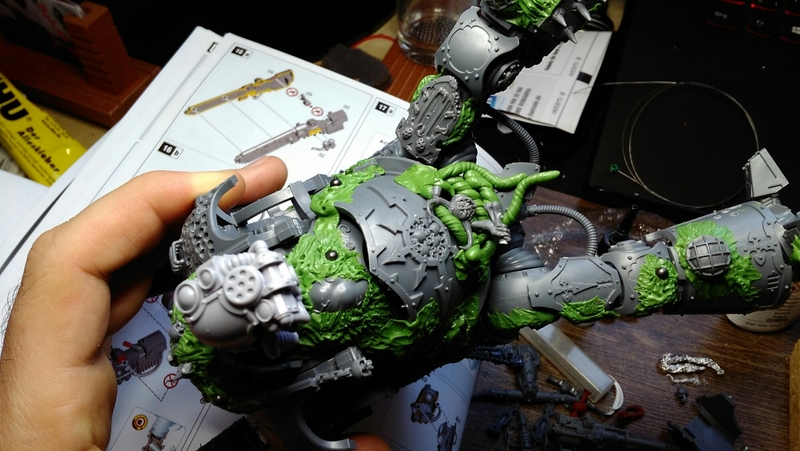 It will consist of a lot of new models but also many non-GW minis as well. After eight month of working on my first comission job ever I can proudly present the fruits of my work for/with Jesse. It was a pleasure! 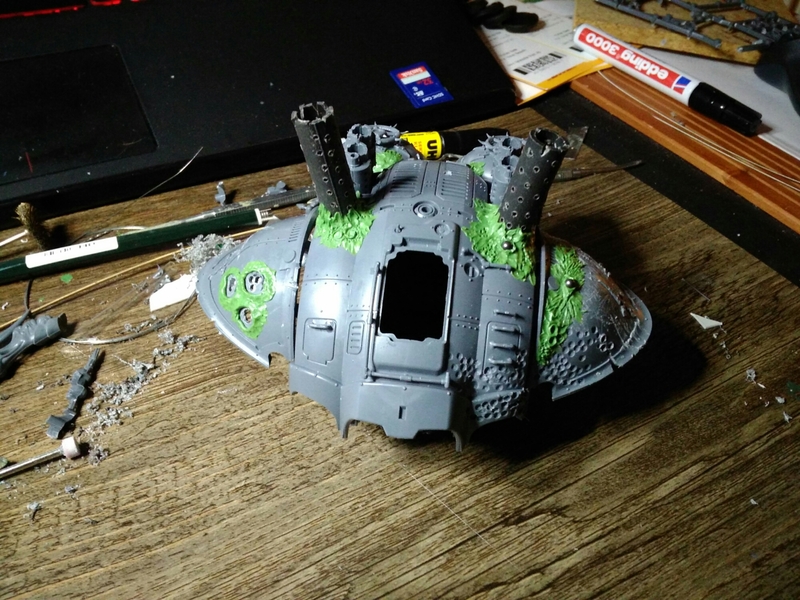 For the last three days Nurgle blessed me with a bad flu and aching bones…I made the best of it and started my Nurgle Knight project! 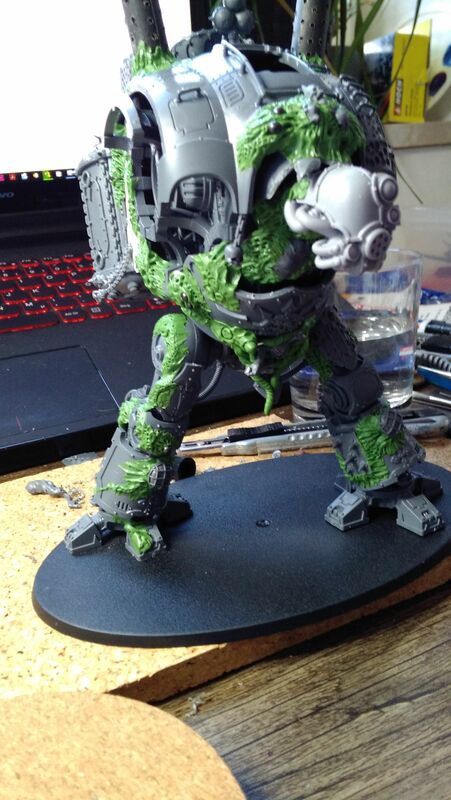 One Lord of Skulls gave the tanks on the back and the belly armour. A Soul Grinder gave his melee claw. The Blight Kings had some nice bitz, too. 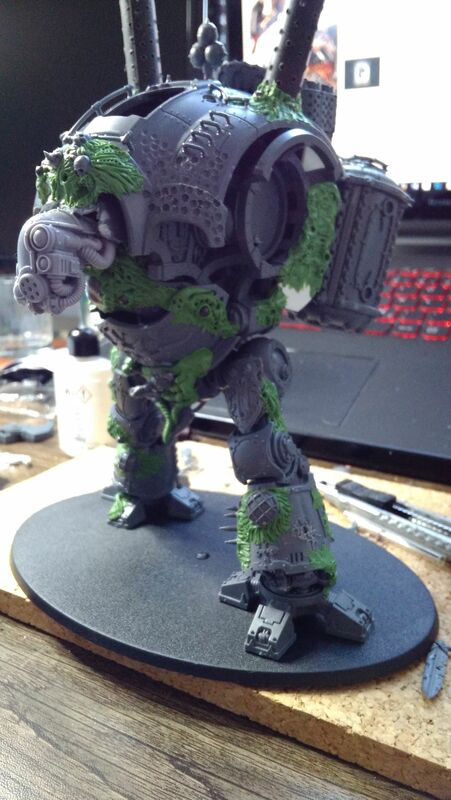 Started my Nurgle Knight Conversion. It will be an Ugly Basterd. 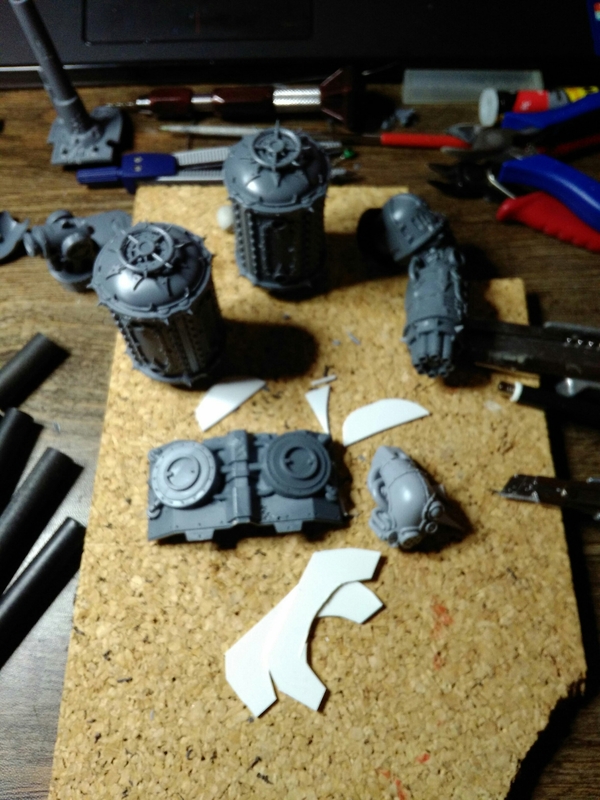 I will combine an Imperial Knight with parts from the Lord of Skulls set and some leftovers. 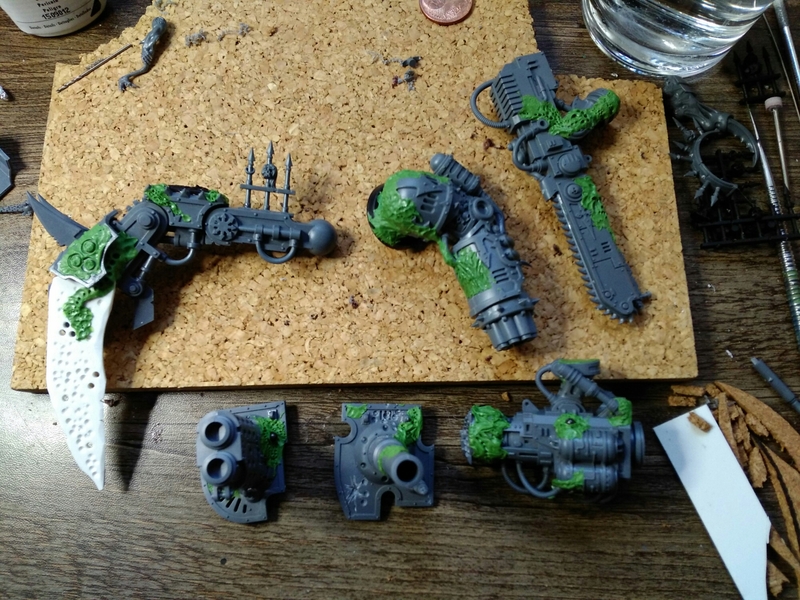 Did I mention Greenstuff? A lot of green will be there just as string from my guitar and plastic card.